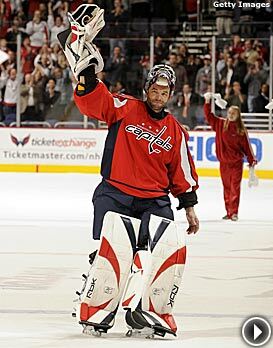 Olie Kolzig became the 23rd goalie to win 300 NHL games as the Caps edged the Flames, 3-2. It took a little help from Alex Ovechkin, but Olaf Kolzig made history on Wednesday night. Ovechkin scored twice and Kolzig made 24 saves to earn his 300th NHL victory as the Washington Capitals beat the Calgary Flames 3-2 at the Verizon Center. Kolzig is the 23rd goaltender in NHL history to win 300 games. But for Kolzig, Wednesday night wasn’t about a milestone victory. It was more about helping his team stay alive in a very tight postseason race. The win moved the Caps within five points of the Philadelphia Flyers for the No. 8 seed in the Eastern Conference. With his team in desperate need of two points in the standings, Ovechkin broke a 2-2 tie with just 1:54 remaining in regulation. With Calgary’s Owen Nolan in the box for high-sticking, Ovechkin took a pass from Mike Green and ripped a shot from just inside the point past Flames’ goalie Miikka Kiprusoff. It was Ovechkin’s second goal of the night and League-high 56th of the season. Washington got on the board first when Viktor Kozlov scored his 15th goal of the season just 53 seconds into the game. The big center parked himself in front of the net and redirected Nicklas Backstrom’s shot from near the right point past Kiprusoff to give the Caps an early 1-0 lead. It seemed as if Washington was going to take the one-goal edge into the intermission, but Jarome Iginla had other plans. The Flames’ captain tied the game with 45 seconds left in the period. With the Flames enjoying a two-man advantage, he fired a rocket from the top of the left circle past Kolzig for his 42nd goal of the season. Kristian Huselius gave Calgary the lead 8:57 into the second period, scoring just as a two-man advantage expired. But Ovechkin — who had a camera dubbed “OvechKam” that followed him around the ice all night long — tied the game for Washington by scoring a power-play goal with 2:05 remaining in the second period. He snapped up failed clearing attempt near the left circle and quickly ripped the puck past Kiprusoff to make it 2-2. With the loss, the Flames — who were 7-1-2 in their last 10 games —failed to pull ahead of the Colorado Avalanche for the Northwest Division lead. Calgary and Colorado each have 82 points, while the Minnesota Wild have 81 and the Vancouver Canucks, who lost in Anaheim, have 80. Boudreau was proud of the way his team responded after the tough weekend. The Caps will look to make it two in a row on Friday night when they host the Atlanta Thrashers. Material from wire services and team online and broadcast media was used in this report.